A quite blowy and relatively chilly evening, needing a fleece to keep warm. Much better temperatures for me to cope with! very rapidly. 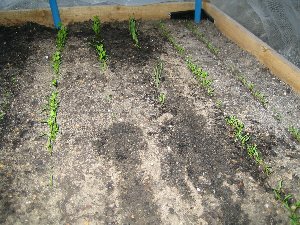 Made three more drills which finish off the planting in the carrot box, sowed one more row of carrots (Flyaways) and then two of radishes as well as adding more Flyaway seeds in the gaps of the previous rows (obvious in the photo, as it´s the watered bits!). Hopefully the latter will have some protection from the flea beetles under the enviromesh, though it´s not the ultra-fine so no doubt some will get in. I did think of planting chinese leaf under there, but they´d not have suited the plantings. Rows are 3" apart, so should allow stuff to grow to full size. 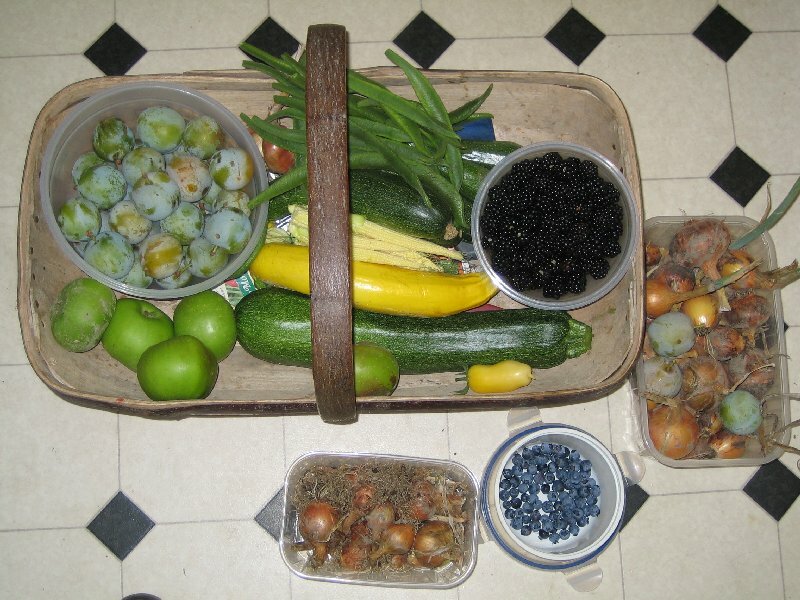 Picked seven more courgettes, a large punnet of blackberries, another handful of runner beans, and a few Bramleys as they´re big enough to use (just) and could do with thinning. My first apple and blackberry crumble of the season got made yesterday, and it was worth waiting for! A few of the newly transplanted lettuces are still alive (though a few huge slugs now aren´t). I expect I´ll lose them, but it´s never easy growing lettuces in the height of summer. Just have to keep on sowing! Blueberries arrived. Unfortunately the courier didn´t bother to ring the doorbell, didn´t bother to even try and see if anyone was in. (Sir was.) He rescued the plants promptly, after the courier had dropped the box over a 6´ gate. They look very sorry for themselves. Rang the Dorset Blueberry Company and suggested they might like to switch delivery firms as this one wasn´t doing them any favours. I don´t want replacements, as I know they´ll grow happily away once in decent pots, and it was mainly currently fruiting stems which had snapped. The new stems were fine, and those are my framework for future years. I just hope that I can ripen the damaged fruit branches so I get to see what they´re like this year! Rainy/blustery evening - another 2.5mm which is good. 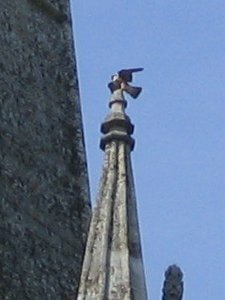 The husk was still attached, so it´s a definite, and the sower must be a tree rat. And it must have been planted before I put the anti-squirrel mesh back on top of the tub after the foliage died down. I have no idea if it´s likely to produce a crop! But fun nonetheless. On the more usual vegetable front, went up to lottie at sunset and picked more blackberries: swapped half with Chris who has got an astonishing number of whitecurrants. I now have wherewithall for loads of jelly! A few more courgettes were ready, and I cut the marrow too. I already have some runner beans, and potatoes, and sage, and I pulled the first onions too, so with some home-made bread to complete the stuffing, all I need is some local protein and a very tasty dinner is in the offing this weekend. Best I could manage with the x3 zoom on the pocket camera. This pic doesn´t link to a larger one as it is the zoomed one! some cooking apples, a single cream sausage tomato and a couple of boxes of varying sized onions. Still small though. More blackberries got picked by P (though only just started on the number which need picking) and a few more blueberries. I took a similar shot of the produce this day last year, showing what did well then. So I´m up on apples and greengages, well down on beans (all types) and carrots, and about the same on soft fruit. There´s tubs of blackcurrants there too, but I´ve not finished picking those over. A job for the weekend I think. 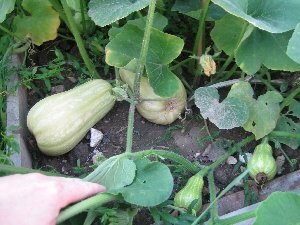 There´s also a couple of marrows, and I do have some of those this year but am not cutting them yet as I´ve still got one at home! And again a single cream sausage! I find it reassuring that the new sowings of carrots and French beans are doing nicely, and that I will get some (eventually!). Spent a bit longer up the plots today, and a long session of picking soft fruit (and getting stabbed by the bramble as usual). There´s a few autumn raspberries, a boxful of huge Ben Connan blackcurrants (first year it´s big enough to have done much! ), a couple of boxes of rather shrivelled Red Start redcurrants (I left them to ripen as a lot were pink rather than red - they never actually went red in the end, so I guess I´m going to have very intense flavour when I jelly them!) 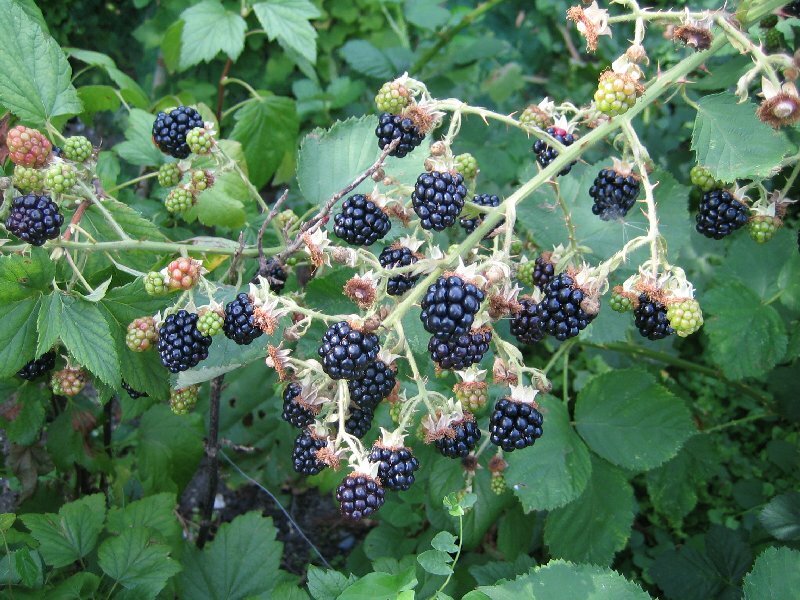 and a huge number of blackberries. Two large lock & lock bowls full (the ones above in the trug pic). More apples (I see it as thinning them! 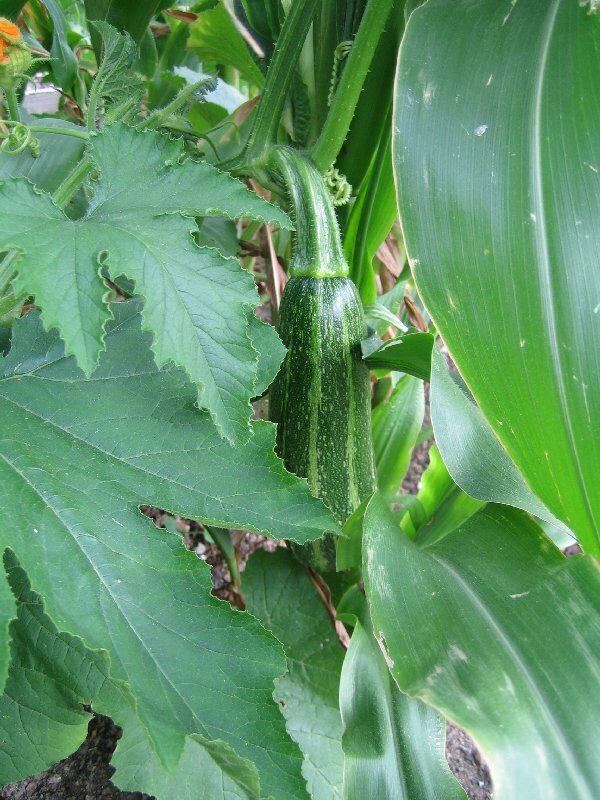 ), more courgettes and minicorn. Got a large bunch of gladioli too, some more poppy seedheads and a few tiny yellow F beans. 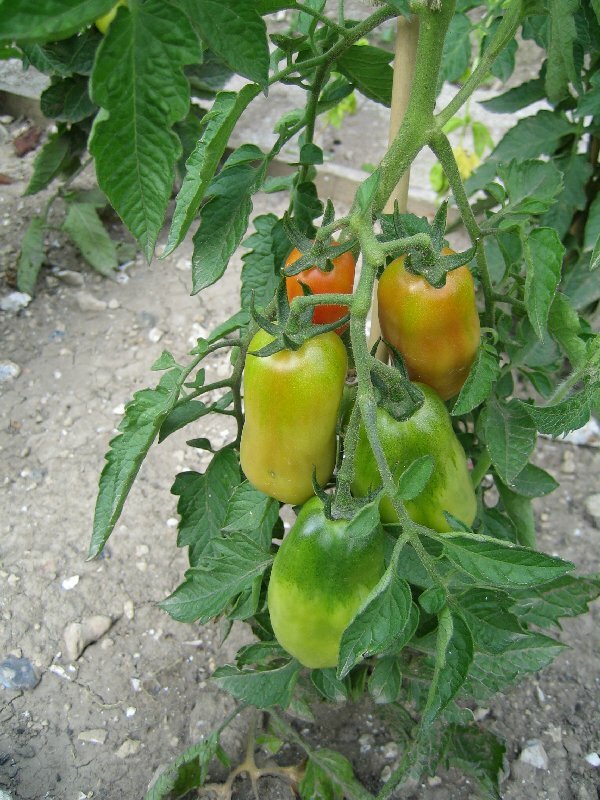 The San Marzano tomatoes are going red :-) and I noticed fleabeetles have got into the red cabbages. Oh well. Will have to derris them after all. Heads are now upwards of 6". Finally made it up to the plot, after several days of reshuffling the lounge, making bramble jelly and finishing my latest cake decorating project. Was pleased to find several ripe San Marzano tomatoes, as well as a few more Cream Sausages. And more courgettes (of course). Though after cutting one of the marrows, proceeded to trip over an even bigger one lurking in the sweetcorn. Think I´ll water this one a lot and go for the giant marrow prize at the Late Summer Show! There´s precious little else going to be ready (Beans? Pfah!) apart from the red cabbages, and no way am I cutting two of those this early! Maybe sweetcorn too, though they are happily growing at the moment. I have a jungle instead of a marrow patch, and as for the butternuts - I moaned they weren´t setting and now it looks like I´m going to have a job finding somewhere to store all of them! I counted eight at least. Had another go at digging the Picasso spuds up and ended up with more Blue Moons. Oops. Have no idea where I planted them now! I´ll find them eventually... But I hope to get more Blue Moons next year if they´re licenced by then - they´re lovely and waxy and the most amazingly dark purple-blue-pink colour. Couldn´t resist the eater apple - the fruit were looking huge so I ate my first one of the season. Slightly acidic, but that one´s always tart anyway. Makes me think I ought to make some apple tarts properly as they should hold their shape (where the Bramley turns to mush). Hmm, perhaps I should go for the fruit classes...! The butternuts are taking over the top of plot 1! Argh! I counted thirteen fruits while hunting through the foliage, so there´s a good chance I´ve missed some. And I moaned I had only one last year. Ha! Be careful what you wish for... where am I going to store that many???? 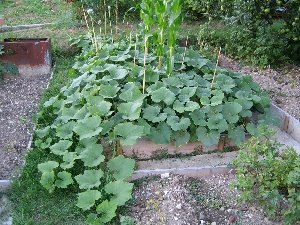 Escaping squash - and there´s only six plants! Autumn rasps are coming online now, and in a week or two there´ll be no risk of raspberry beetle either so they´ll be clean. There´s still a little bit of it evident but not much. Found out what the pesky brown bugs are that I have to keep shaking off the blackberries - dock shield bugs. Harmless, just a bit of a nuisance as they, like all shield bugs, stink... Picked a large punnet of the brambles anyway, a cabbage (at last! 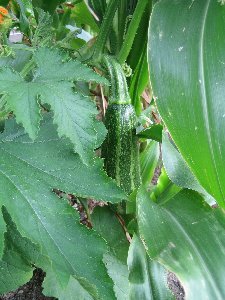 ), found the Picasso spuds and dug a plant up (only a few tubers though - it´s just too dry), some huge beets (which have done very well this year), some more onions, another half dozen courgettes and discovered that one of the marrows from the sweetcorn is also trying to take over. Got a few tomatoes, a few gages, totally forgot to pick up some more Bramley´s seedling apples (Grrr! There goes my crumble!) and picked loads of dahlia flowers too. If my monster of a cactus flower is the size they´ll all end up and is typical of the numbers of flowers produced, help... Got a few runners and a few minicorn too, but the main corn is nowhere near ready, despite the cobs being so full they´re peeking out the top of the husks. Ow. Got buzzed by bats as I made my way to the gate, so decided to have a laugh and see if I could catch one on camera. I did, too, though it´s a fuzzy blur! Quick trip up to the lottie very early, as I needed to pick over the courgettes and minicorn before dashing off to see the folk from Allotmentsnstuff, who were gathering in Suffolk. Cut back the comfrey again, though was unable to put the leaves in the same bin as last time since it´s been overgrown by the bramble. (And I´m not brave enough - or armoured enough - to move it!) The marrows are doing well, as are the French beans (finally) which are getting ready to flower. The runners are now setting well, too. I hope for lots more beans in a week or two. Derrised the red cabbages, though not to much use as while I was away, there was an incredible 29mm of rain. That means we´re well above average for August. Carrot bed doing well, parsnips gradually growing (though the ones I thinned were all of 2" long so they won´t be pulled for a long while...) and major blight warning issued as we finally crossed the Smith Period threshhold. Will have to watch spuds and tomatoes like a hawk now. *sigh*. To my amazement one of the sweetcorn looked ready, so I picked it. Yum! Collected some more apple thinnings and went off to the gathering. Back from the gathering (fun!) I found myself with a very wet garden so left the lottie alone and made marrow and ginger jam instead. It´s a faff, but yummy once done. My method is adapted from one I found here on the net: 4lb peeled, deseeded and cubed marrow, 4lb jam sugar, 1.5oz ginger powder, juice of two lemons. Put everything in a large jam pan or stockpot, add a couple of tablespoons of water to start it off, then cook it gently until the water starts to come out of the marrow. Whizz with a hand blender so the marrow´s shredded well. Then continue simmering until it goes translucent (about 30 minutes) stirring every 5-10 minutes or so to stop it catching. Then switch to boil mode and boil, stirring constantly until it gets to setting point. It fortunately does this quite fast with the pectin-added jam sugar. It also burns very fast if you don´t stir! Successful result is about 5-6lb jam. Quite dark tonight, so didn´t get as much picked as I´d hoped. We got the first full blight warning of the season over the weekend, and so I took up the big fork and secateurs and hoped I wouldn´t find anything. I didn´t, but just in case, I picked all the reasonably ripe tomatoes and then dug up the last early spuds, which I´d left in since nothing much was growing in there during the early part of the season. Got quite a lot of decent International kidney this time - they really did need the extra time - and also a few remaining Red Dukes and Kestrels. To my delight, the latter gave me a huge tuber perfect for baking. About time, too! Would have been easier digging if I hadn´t been Sir Isaac Newtoned several times by the perishing Bramley. It´s dangerous digging underneath it! Did manage to get a few courgettes too (surprise) and some more minicorn, which is doing very well this season. Probably because I´m actually remembering to pick it before it gets too large... Also picked another corn on the cob, but it was not quite ready. Not bothered - this variety is very sweet and lovely even if slightly under-ripe. 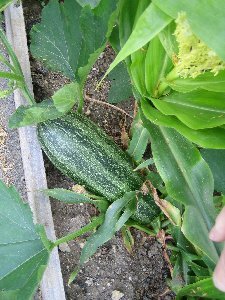 Checked on the massive marrow - it´s now about 18" long I think, and will need a wheelbarrow to get it out of the allotments. I still haven´t given it any extra water - perhaps I ought to! Two more are almost at full size so it´s not as if I´m going to be short of the things... Could only see a couple of runner beans, but that was all because of the light. I´m sure that next time I´ll be up in brighter conditions. Staggered back to the car with rather more tomatoes and potatoes than I´d expected. The tomatoes are now finishing off their ripening in the house; there´s three dinner plates full and this is only the tip of the iceberg. I feel the passata machine will be coming out this weekend and not going back for some time. Especially as it´s also apparently excellent for juicing brambles. Seriously unhappy. Someone´s stolen all the remaining greengages. And I mean all of them. Tree is bare. A lot were very wasp and maggot infested, so I can but hope they got their comeuppance (and stomach ache to boot). There were stones all the way down the path so I know it´s not a wasp swarm or anything like that. I´m most upset because I wanted to put some into the show next week. I shall have a good moan at the AGM about security. Meanwhile, cut two more cabbages as we´ve eaten the first one already. Loads of coleslaw! Pity I´ve not managed to coordinate cabbage, carrot and onions yet again, but the carrots are growing as fast as they can. Tomatoes still looking blightless (phew) and ditto spuds, though some of the latter have died back already so I can´t say. If I can get more small glass jars I am tempted to make green tomato chutney, but I might as well wait until they are definitely blighted and I have to strip the bushes before I do that. So I guess meanwhile it´s more ratatouille! Managed to get another bowl of brambles (now going very soggy and slightly mouldy) and got mugged by the briar as usual. Ow. Perhaps I ought to train it round the gage! Hmm now *there´s* an idea... Also got a decent number of raspberries. But thanks to being given some garden tokens, I now possess one of the more expensive Wolf Garten tools, an extendable apple picker! I think that it will *just* reach the top of the Bramley. Tested it out on a particularly high fruit and ended up knocking two more off while trying to pick it. Hey ho. There´s going to be a windfall collection this weekend too if it´s dry, and a large amount of chilli jelly is going to be made. Jars permitting. 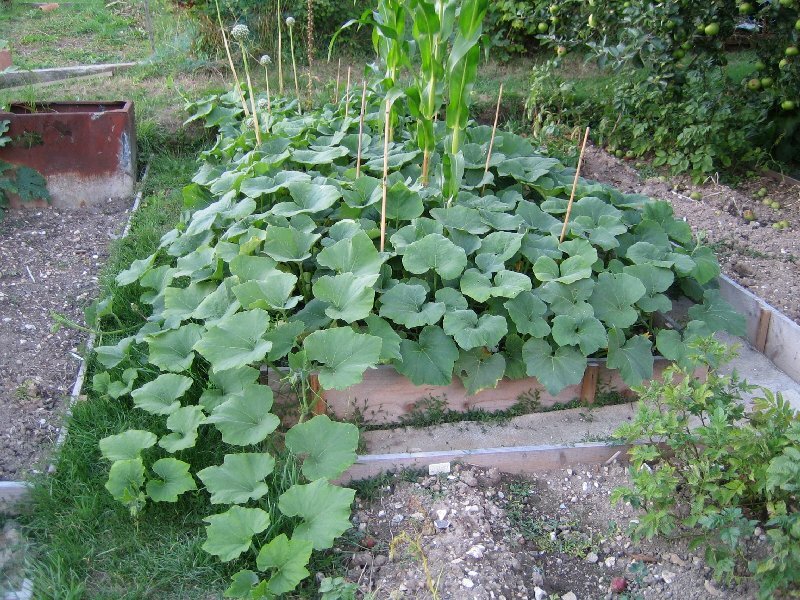 More courgettes appeared, and the giant marrow´s turning orange. Tempted to pick it sooner rather than later, though that will entail a hernia I suspect. Hopefully more corn will be ready soon. Loads of baby runner beans now, about 2" long. Hurrah! Despite going up very early, darkness came very suddenly, and after chatting with Maggie (and begging a recipe for spinach and cheese quiche) I went home and made cucumber pickle. Quick dash up with vegetarian friends to do the pick-your-own thing, and managed to pick some stuff for them. Left them a bit gobsmacked - and myself also, given the amount of rain we´ve had in the last couple of weeks has caused the red cabbages to expand even more. They´re colossal now. 7" diameter globes. I just want them to last until Christmas. They seem to be performing exactly as it said on the box, as it were: Description: One of the best red cabbages. Large, tightly packed hearts with crisp, ruby- red leaves. Excellent standing in the ground and storing ability. Oh good - they should be fine then. More rain overnight and in the morning: we´re now at 130% for August, and the four-month average is just that. It´s perhaps worth mentioning that last year, the ash trees were the very last to break into leaf, while this year they were one of the first. The old saying goes, Ash before oak, prepare for a soak, oak before ash, prepare for a splash. Well, seems to have worked this last couple of years... Bit too damp to go and weed anything. Jolly chilly overnight. Had to put the conservatory heater on in the morning as it´d dropped to 11oC and the tropicals don´t like it that cold... and I don´t want them to get chilled as I´ve just noticed that the strelitzia has got two flower spikes growing! Hope the tender plants outside weren´t too cold either, especially since today we´ve had an unearthly mix of glorious sunshine and thunderstorms. Bit better day weatherwise - slightly warmer. Hopefully the cold will prevent any more blight warnings. Went up in the evening armed with the apple picker though not sure whether that was the Wolf one or Sir, who came up to help. Picked a silly amount of fruit, so now have apples everywhere, sweetcorn, courgettes, raspberries and blackberries. The runner beans are getting there (slowly) and the French beans are at long last setting! Put a cloche over the shallots, which have been trying to dry for a few weeks now, and keep getting rained on. Pulled a few radishes, and lamented the gages once again. Got a few going-red tomatoes as well: the temperatures aren´t enough really to ripen them much more, and so I´m taking off as many as I can to finish off indoors. I think I need to go back up and take off lower leaves to help. I also need to sort out the minicorn and the soya beans. The latter are nicely green now, and I need to get them frozen while they can still be used for edamame. Desperately need to do something about the apple trees though!